We don't just sell boats...we sell the cruising boat lifestyle! Anything from a small cruising boat to large yachts. Let us introduce you to your next boat and the wonderful world of cruising. Prepare to experience one of the most enjoyable recreational sports you will ever encounter. The world is yours to explore. 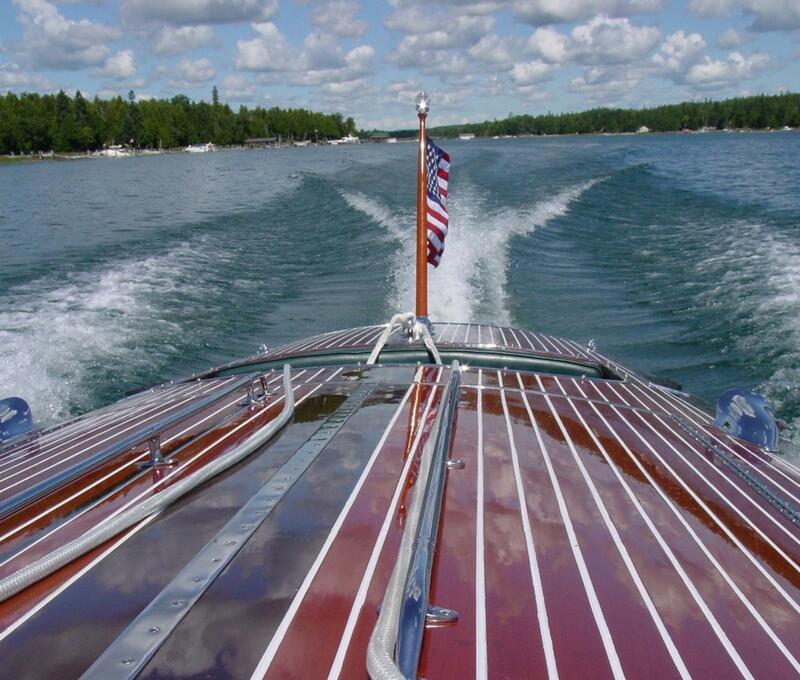 We are your Great Lakes connection for freshwater boats and yachts...with two locations on Lake Michigan. Saint Joseph, Michigan and Sturgeon Bay, Wisconsin we are situated to be your one stop shop for used, pre-owned brokerage boats and yachts. With over 27 years in the Brokerage business, let our experience work for you. Ask us for first hand advice about cruising the Great Loop, Trent Severn Waterway, North Channel, Florida Keys and of course our backyard...the Great Lakes. We also coordinate and orchestrate all elements of the sale, both before and after...Financing, Insurance, Deliveries, Instruction, Trucking and Shipping. Let us work for you! If you don't see the boat or yacht for sale here that you are looking for...give us a call and we will find it! Used boats, pre-owned boats, consulting on your next boat...we do it all. We look forward to working together to make your dreams come true! Powered by low hour Volvo 575hp,D9's. The Cranchi 47 HT embodies all that one would expect from an Italian boat...Style, Luxury and Performance combined with plenty of the unexpected...superb engineering, amazing space utilization and superior performance and handling. Large bow master stateroom with ensuite head. Aft stateroom features double bunks and an ensuite head as well. Upscale appliances and fixtures. All options, excellent electronics, in a turn key package that is ready for your next cruise. 2 zone Tropical Air for helm & cockpit area. Underwater lights. New cockpit soft goods and canvas in 2013. All new covers for exterior vinyls as well. New hull side color updated in Summer of '13. Super Sharp!! Now one of a kind, custom look. Must be seen. Call us today for more information. We now have an expanded brokerage list offering boats and yachts for sale from: Back Cove, Boston Whaler, Chris Craft, Cranchi, Cruisers yachts, Carver Yachts, Everglades, Formula, Hatteras Yachts, Marinette, Nordic Tugs, Ocean Alexander, Sea Ray, Sunseeker, Tollycraft, Trojan Yachts, Viking Yachts, and World Cat. NOW PRICED TO SELL AT $ 275,000. 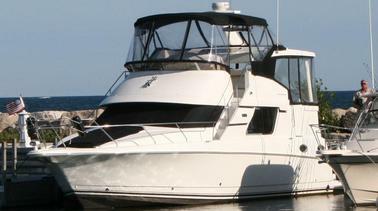 Great opportunity to own a 100% freshwater Viking Yachts Enclosed Bridge 58 Convertible. Powered by twin 16V92DDEC's with only 1,700 original hours. Cruise at 35K and WOT is 39K +. Cruise anywhere in style and comfort with the protection of the enclosed bridge...two new Stidd chairs provide plenty of comfort for Captain and mate. There are two couches providing plenty of additional seating. Ice maker and refrigerator make going down below unnecessary. This is a three stateroom, three head layout with the side master stateroom, VIP stateroom forward and a bunk room to starb'd. Huge salon and galley...all on one level. All new stainless steel appliances in 2012. A Noguchi table adds elegance and style to the large L-shaped sofa in the salon. New cockpit carpeting and furniture make the cockpit area the entertainment center of the boat. Must See! OFF THE MARKET FOR NOW...WILL BE RELISTED IN THE FALL OF 2015 ! "Lady Santine" is an immaculate and very well equipped version of this top selling model. She features an extremely spacious layout with two large staterooms w/ ensuite heads and showers. This popular motor yacht features every option from Silverton including multi-zone air & heat, generator, windlass, ice maker, cherry interior and updated electronics. Newer electronics include a Raymarine C-120 color chart plotter w/ Pathfinder color radar, Raymarine ST 8001 Smart Pilot Autopilot Raymarine ST60 Tri-data and a Raymarine Ray 55 VHF w/ DSC"windlass, ice maker, cherry interior and updated electronics. Flo-Scan meters are installed at the helm. 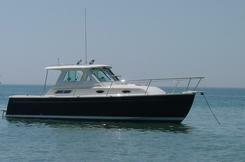 She is powered by twin Crusader 8.2 MPI gas engines with only 672 hours. Her 8KW Kohler generator is like new with only 137 hours. For ease of docking she is also equipped with a Lewmar STERN THRUSTER! Eliminating the side decks in favor of elevated stairs provides both safety going forward and an enormous amount of interior space. Her bridge is roomy and she features bench seating fore and abaft of the helm seating. The aft deck features a hardtop, rear bench seating and wet bar and ice maker. Plenty of room to create and serve your beverages of choice. She truly must be seen. This Silverton 392 has been meticulously cared for and shows like new. Located in Oconto, Wisconsin. Shown by appointment only. Click on the picture for full spec.'s. Priced to sell at $ 90,000. PLAY OUR "LIFESTYLE" VIDEO...WE LOVE BOATS AND THE BOATING LIFESTYLE ! Great opportunity to own a totally freshwater, low hour 36 w/ recent Jade Green Awl Grip paint job. She looks spectacular and the contrast with her gold leaf name is just fabulous. New Stidd seats, upgraded Raymarine electronics, custom mast, air and heat, generator make her a must see for the serious buyer! Low hours on CAT 3116's. She will cruise at 20 knots and top out around 25. To our knowledge...there are no other existing freshwater 36's currently available. Don't miss this one. Shown by appointment only. Stored indoors, heated for her comfort. 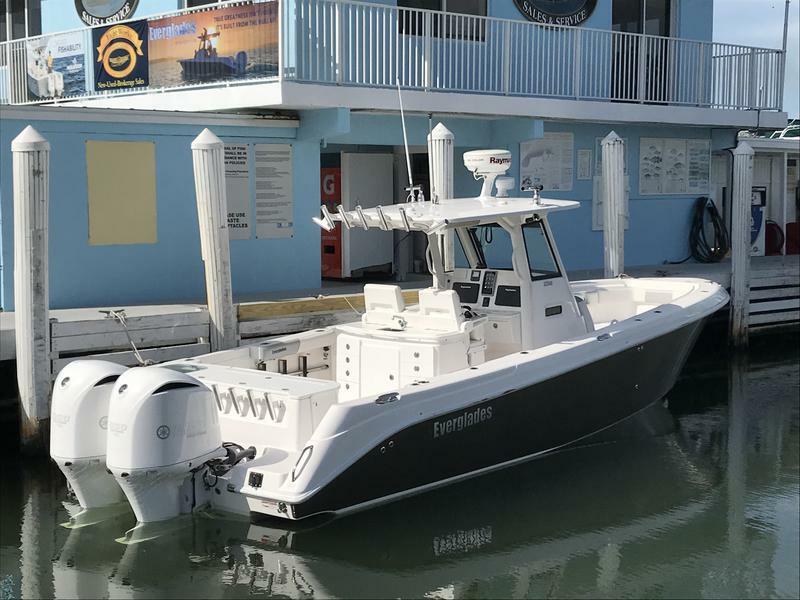 Amazing opportunity to own a low hour (48 original hours), one original owner, exclusively FRESHWATER BOAT, the Everglades 325cc brings luxury to the center console crowd. Powered by twin Yamaha 350 hp Four Stroke outboards, she will cruise in the mid 30's + and top out at around 57 mph. All updates have been performed and she is ready for your next fishing date. All of this luxury runs around on our proven 25 degree variable deadrise hull form. This boat eats up big waves and standing chop. Protected by our fully enclosed windshield, cruising is comfortable, quiet and dry, making the boat ideal for Great Lakes cruising. We are now spending more time in the Florida Keys, selling and marketing Everglades Boats for Yacht Works. While we are still maintaining our brokerage business up north we are enjoying the weather and the ability to boat almost any day we want. We are discovering the fun of cruising in outboard powered boats and as such we can offer Everglades Boats in the mid-west thru Yacht Works, our parent company, located in Sister Bay, Wisconsin. Everglades Boats are manufactured by Bob Dougherty, the same man behind Boston Whaler and Edgewater boats. The ride and sea keeping abilities of Everglades Boats really must be experienced first hand and the luxury features that are standard upon the boats provide a level of quality and detail that are unequaled in the outboard marketplace. Everglades builds boats from 23' to 43' and in addition to center consoles, also offers cabin boats from 32' to 35'. Engines are all Yamaha for reliability and service. Everything is built and assembled in house for extreme quality control. As Bob Dougherty says, "Quality is no coincidence." So, if you are tired of wintertime up north and want to experience an endless summer, come visit us in the Florida Keys and check out Everglades Boats...you'll be hooked. Oh yeah, the fishing isn't too bad either. The snorkeling and diving on the ocean side is unbelievable...the water clarity is unreal and fish and corals are everywhere.Its a magical world under the water. Click on the Pictures for full specifications ! Best Boat / Lowest Price in the U.S.
website for Everglades Boats...all about the Keys & Everglades Boats !